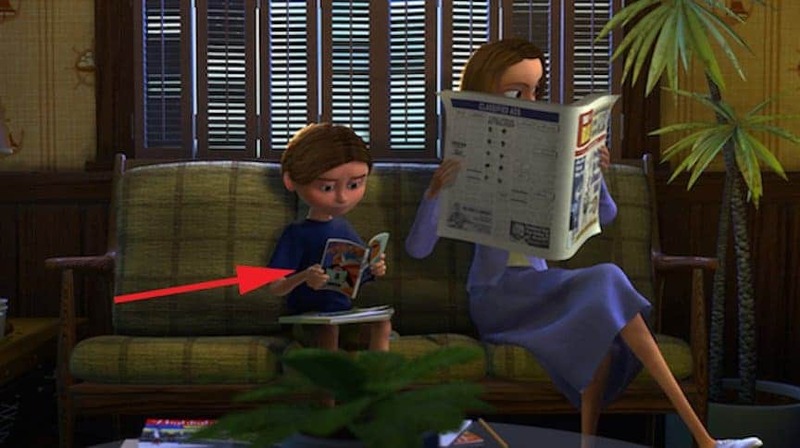 Since it began making movies for Disney, Pixar has always been known for its intricacy and attention to detail. 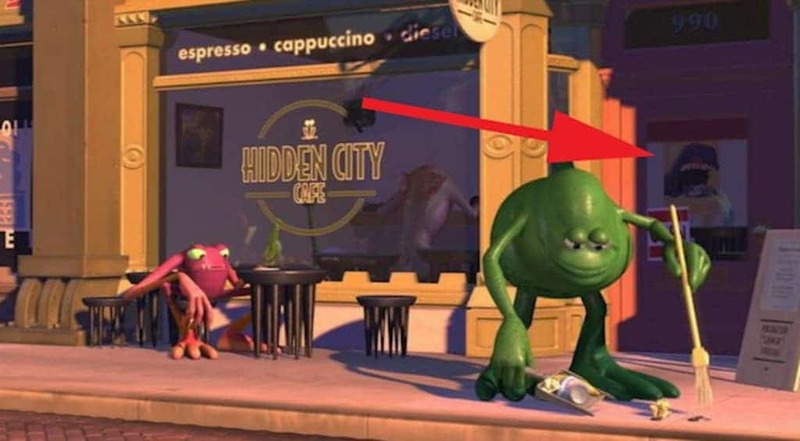 You’re probably already familiar with the A-113 Easter egg, a reference to a room at the California Institute of Arts where Pixar filmmakers like Brad Bird and John Lasseter used to take classes. 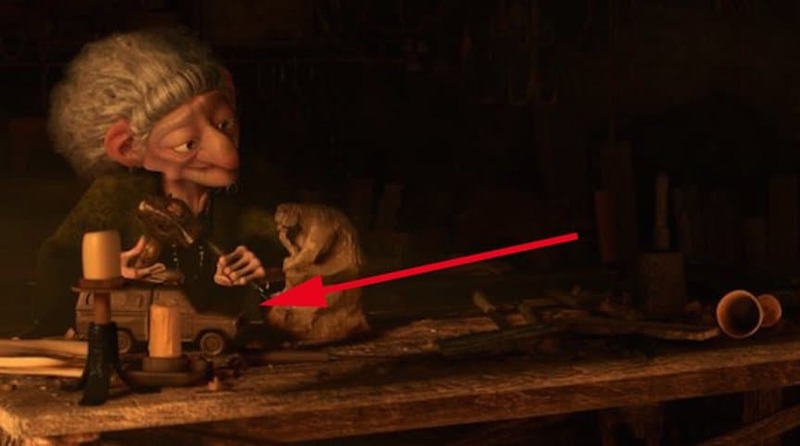 But a lot of the time, the little winks that Pixar is able to squeeze into their films are not as easy to spot, whether they are nods to their own movies or just other Disney movies in general. As Pixar’s first real villain, you probably remember the sadistic Sid from the original Toy Story movie. 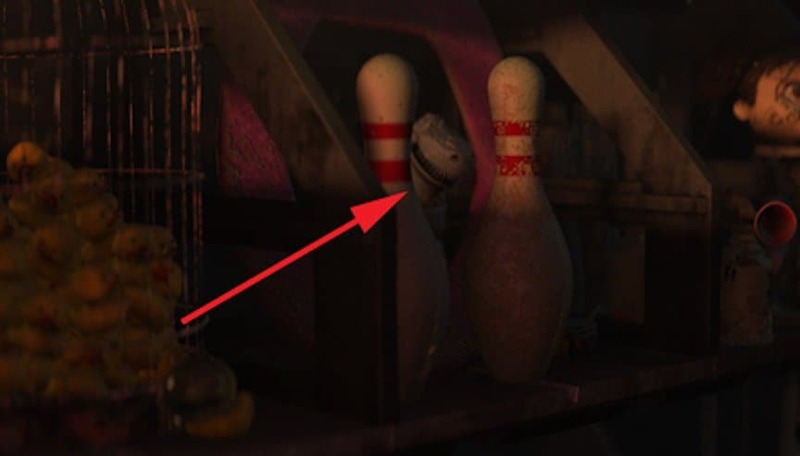 What you may not have realized is that Sid makes an appearance in Toy Story 3 as a garbage man – just look for the skull shirt. You see a lot of different vehicles in a movie about an alternate universe that is populated by cars. But if you watch closely, you’ll see a visitor from another Pixar world – the Pizza Planet Truck. While waiting for a dreaded dental visit, everyone needs a little reading material to ease their minds, even the characters in Finding Nemo. Just look at the boy in the waiting room – he’s reading a Mr. Incredible comic book. When Carl’s house first flies off in Up, he passes a high-rise window of a little girl’s bedroom that seems pretty innocuous. What you might have missed was it includes not only the famous Luxo ball but also Lots-O-Huggin’ Bear from Toy Story 3. Everyone needs a good education, big and small, human and toy. 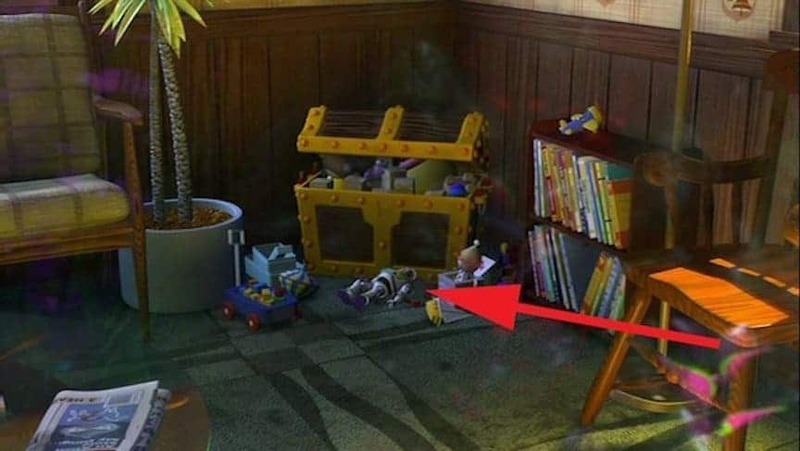 In Toy Story 2, Pixar uses its own stories to educate the little one – Mrs. 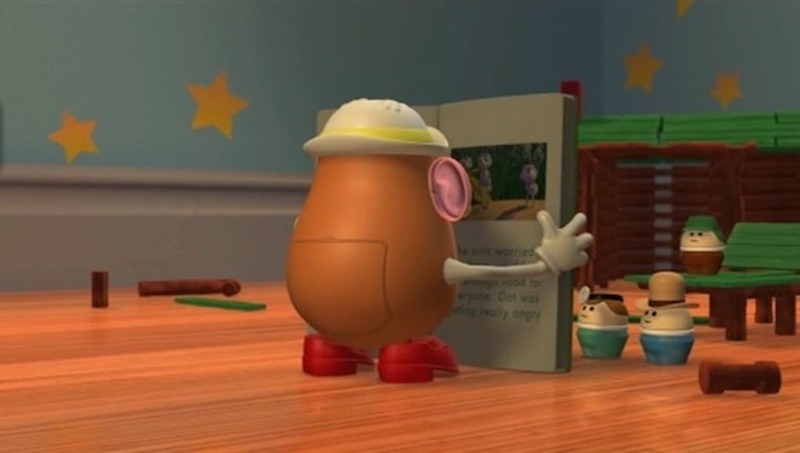 Potato Head can be seen reading the book of A Bug’s Life to the Toddle Tots. The creepy old witch in Brave has more up her sleeve than weird spells that turn people into bears. If you look on the table where she does her whittling, the witch has a small, wooden Pizza Planet figurine. The story of Ratatouille is romantic to say the least, but it isn’t as happy as it might seem. 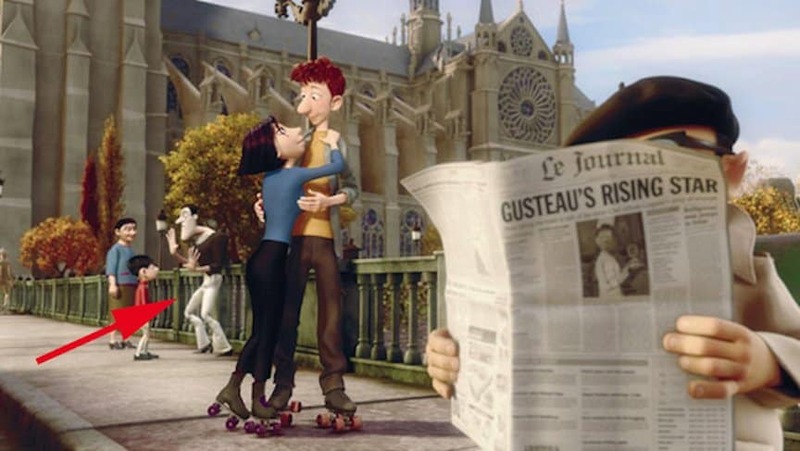 If you look closely behind the adoring couple of Linguini and Colette, you can see one of Mr. Incredible’s nemeses, Bomb Voyage, performing a mime act. There are so many wonderfully colorful things to look at in Finding Nemo. While you got an eyeful of all the beautiful fish, you probably missed the toys in the Dentist’s waiting room – a collection that includes everyone’s favorite space ranger, Buzz Lightyear. Some of Pixar’s best characters are just too cute and entertaining to be stuck in a single movie. 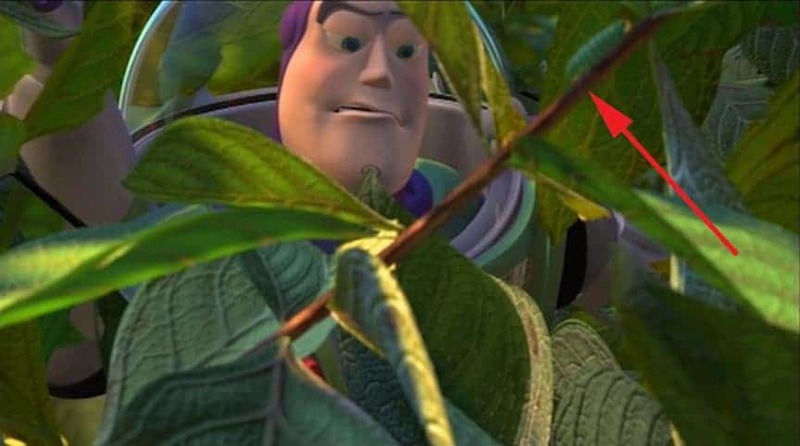 Case in point, the adorably oafish caterpillar Heimlich from A Bug’s Life can be seen crawling on a bush branch in Toy Story 2. The world seems so large and terrifying for the adorable Remy in Ratatouille, but there’s one scary thing that you should easily recognize if you’re a Pixar fan. 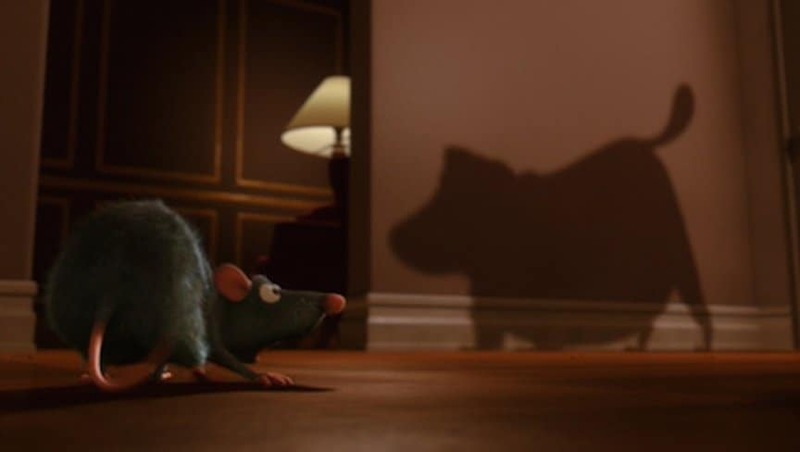 While Remy is making his way through a house, he is barked at by Doug the dog from Up – you can see his shadow clearly on the wall. What kind of gift can you give to a giant furry monster that you love? 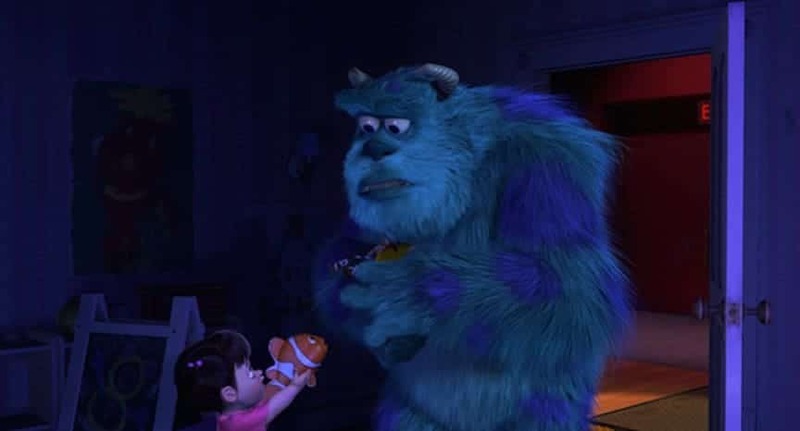 The best thing, if you happen to be the adorable Boo from Monsters, Inc., is to give him your stuffed Finding Nemo toy. Doc Hudson was a very important character in the Cars movie, but that wasn’t the only Pixar movie he appeared in. 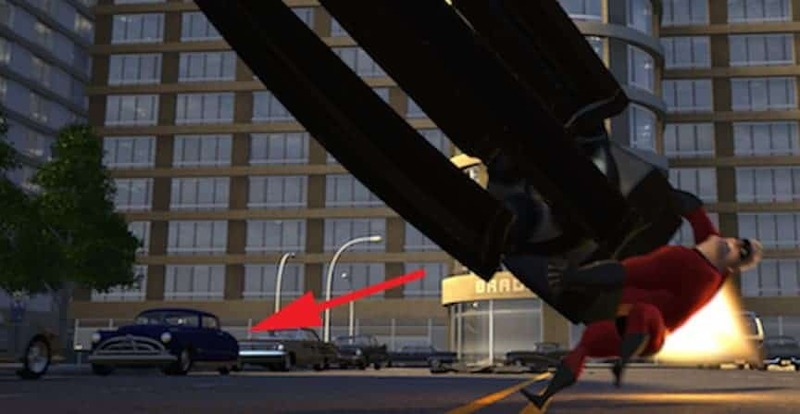 During the ultimate battle in The Incredibles, you can see Doc parked on the side of the street. 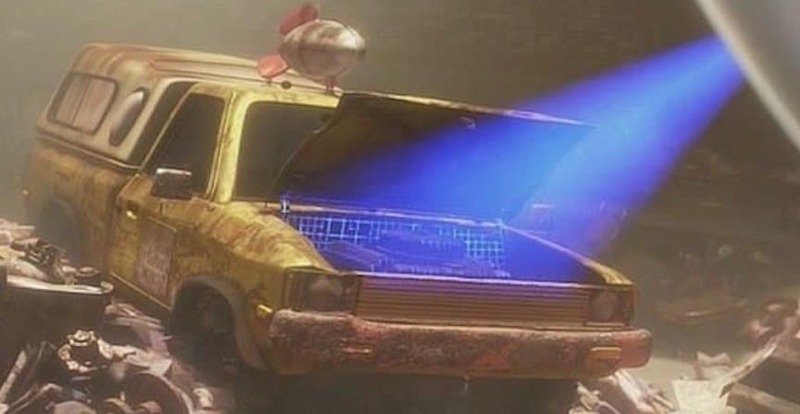 If you watch WALL-E closely enough, you can see that the plucky robot isn’t the only thing that has lasted a few centuries in the dusty wasteland. While EVE is searching for plant life, she happens to look inside an old Pizza Planet truck. While living all alone on the barren planet Earth, the cute little robot WALL-E collects a lot of trash, but he has some treasures too. If you look closely, you can spot Pixar’s favorite neurotic dinosaur toy, Rex. 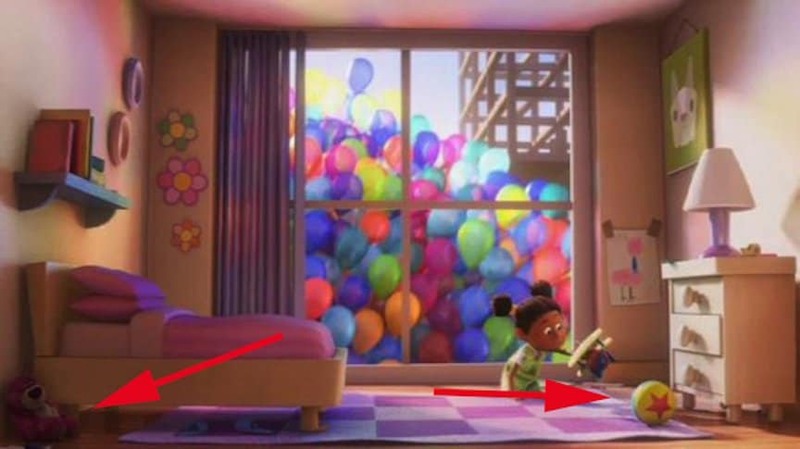 Pixar’s obvious weakness is letting characters of their movies appear in their other movies. 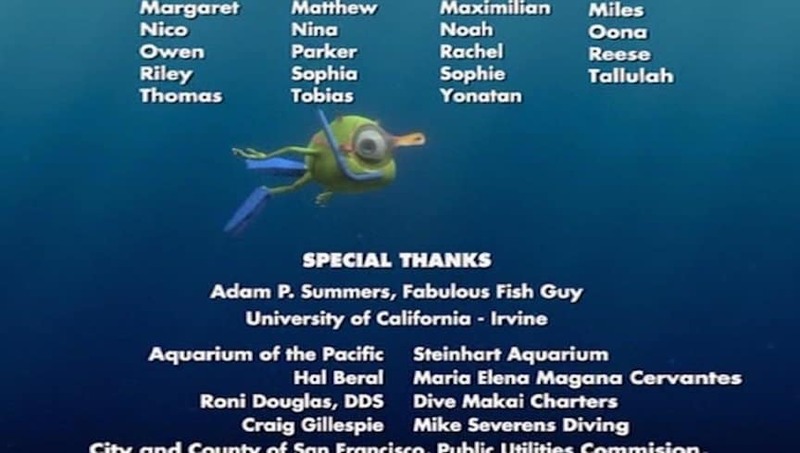 An obvious example would be in Finding Nemo – if you watch far enough into the credits you can see the funny, green one-eyed Mike Wazowski snorkeling past the screen. Just like so many superheroes, Mr. Incredible is beloved by lots of people across the world. One such person happens to be Ratatouille‘s Linguini, who is seen wearing Mr. Incredible boxers shorts underneath his uniform. Since in the world of Cars everything has to do with cars, regular names wouldn’t do – they have to fit in with the cars theme. 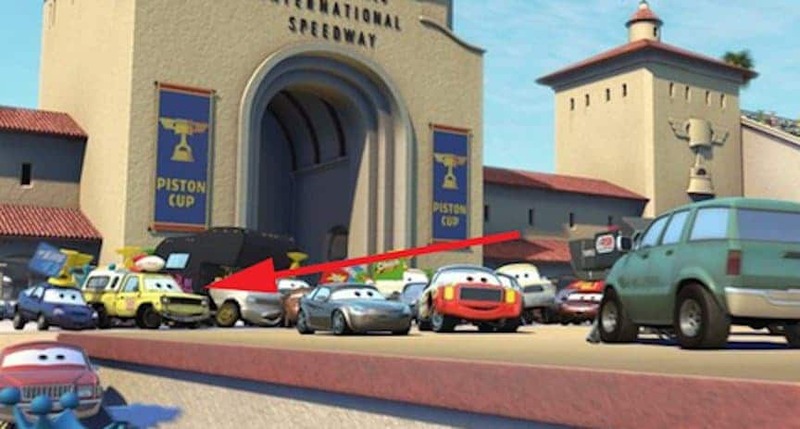 In Cars 2, Mater and Lightning McQueen pass by a drive-in movie theater showing The Incredibles, or rather, the Incredimobiles. In the world of Monsters, Inc. everyone loves a scary bad guy, as you would expect. If you look closely by the monster cafe, you can see a poster of one of Disney’s most classic monsters – Monster, the whale from Pinocchio. Although it takes a lot of attention to see it, the Fredricksens of Up are friends of Andy’s family in the Toy Story movies. 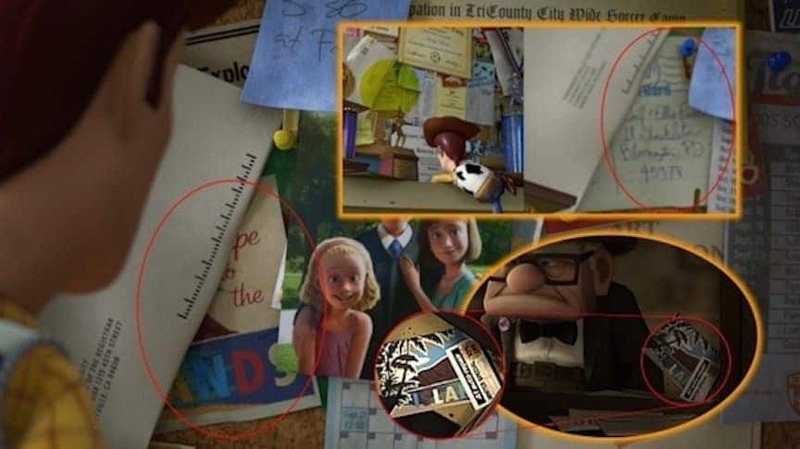 There is a postcard from Up that shows up on Andy’s cork board in Toy Story 3 if you look really, really closely. In Monsters, Inc. the creatures use magical doors to get from their universe to the human world, but it goes farther than you’d think. 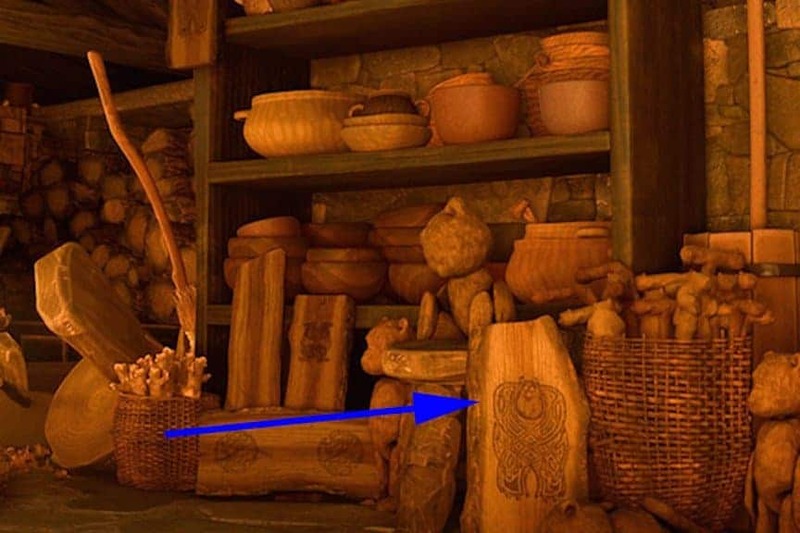 Apparently, they have doors that open into medieval Scotland as you can see a carving of Sully in the witch’s cabin in Brave.